I must say, Minneapolis has bad luck with bridges. 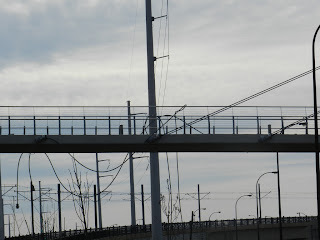 This morning I arose to reports that the Sabo Bridge was closed to traffic due to a cable problem, and in fact the Light Rail and Hiawatha Ave. (which the Sabo bridge goes over) were also closed to traffic. I have been fighting a bad cold, but I shrugged off the blankets and went up there this morning to see what was to be seen and shoot a few photos before this gets cleaned up. 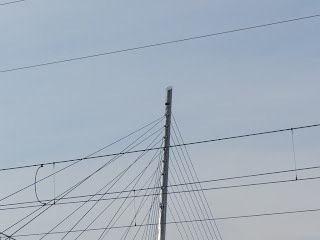 It looks like the two eastern-most cables (the longest ones) separated from the tower on the bridge and slithered down from their anchors on the sides of the bridge. 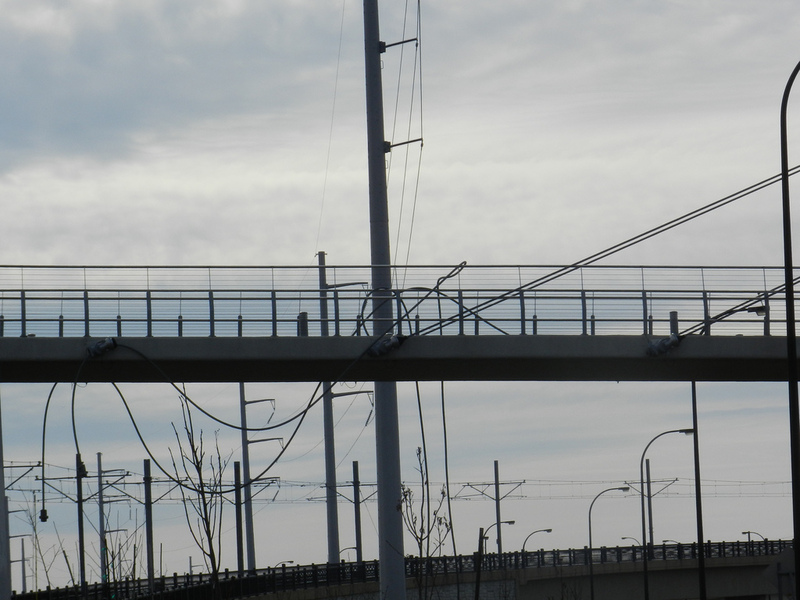 Early reports from the Star Tribune indicate that two other sets of cables are also severely "compromised" and workers were placing shoring under the bridge today. 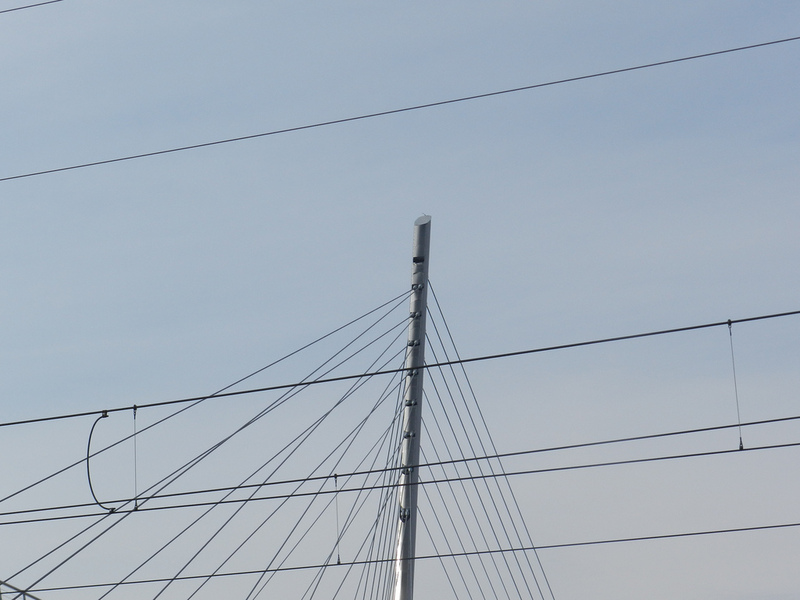 Apparently, somebody was walking across the bridge last night at about 10:30 and found the cables laying on the deck of the bridge. The clear-thinking citizen called "311" and reported it. That's one 311 report the City jumped on, apparently, because it was closed right after that. 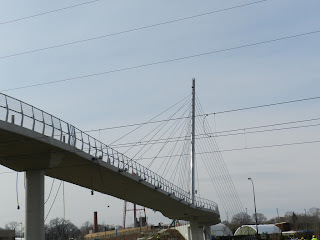 The Sabo bridge opened for business in November 2007 at a cost of $5.1 million, and it has become the iconic symbol of Minneapolis bike infrastructure. It's so new that the problem has to be a design or construction flaw rather than lack of maintenance, I would guess. I am hoping a security camera caught the cable snapping. I would have loved to have seen that - it would have been on hell of a KER-TWAING. Depending on what happened, I can foresee this bridge being closed for awhile. 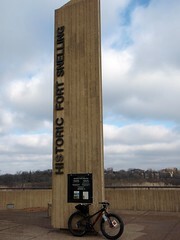 If the main tower is sinking, or the footings are shifting, that would be a lengthy repair, I suspect. On another note, the design engineer for this bridge was the same as for the I-35W bridge over the Mississippi. I got an email recently from a person that has started yet another bike blog. This one is called MN Bike Trail Navigator. The tag-line kind of says it all - "a resource for exploring Minnesota's scenic bike trails". Recent posts include a report on trailhead upgrades at Lebanon Hills and an update on the Mississippi River Regional Trail in Dakota County. The site also offers lots of links to map resources that should prove handy for anyone looking to get out and explore some trailage. MNBike Trail Navigator gets around in cyberspace, too. There is the blog link (above) as well as a Facebook page and Twitter (@mnbtnavigator). I'll add a link to this in my "Friends" column on the right side of this page as well. On that note, if you have not seen it yet, check out Fat Tire MN's blog as well. He's another recent addition to the Hall of Friends; I didn't realize he had a blog although I've been an admirer of his fat tire photos for some time now. 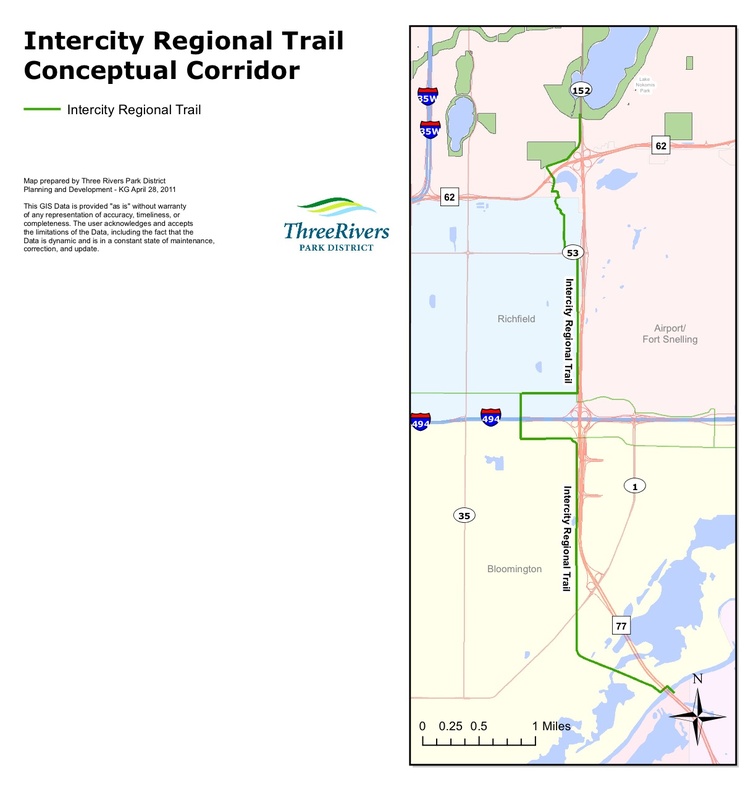 Three Rivers Park District, the Minneapolis Park and Recreation Board, the cities of Minneapolis, Bloomington, and Richfield, and other project partners are working together to finalize a master plan for the Intercity Regional Trail. 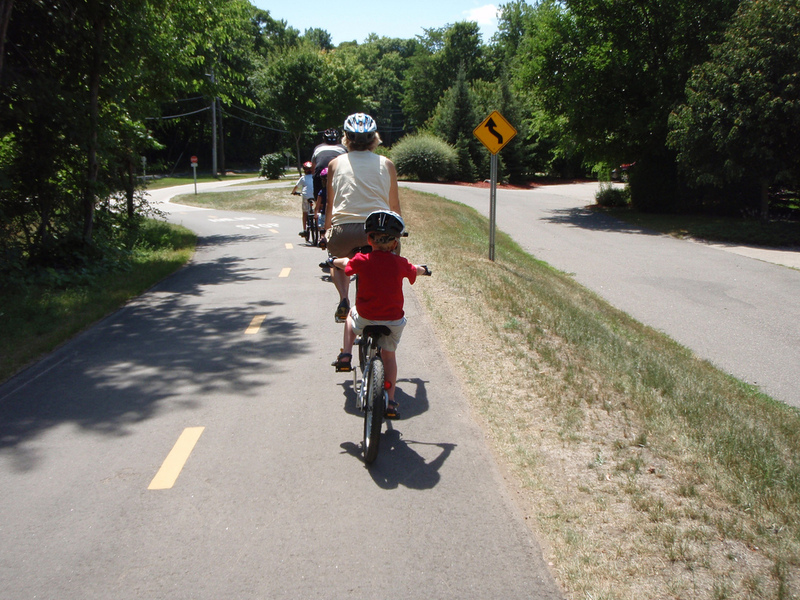 When completed, the seven-mile Intercity Regional Trail will provide a paved, multi-use regional trail route from Lake Nokomis Parkway in Minneapolis south through Richfield and on to the Minnesota River in Bloomington. 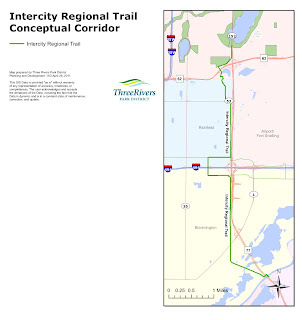 The trail will connect to the Minneapolis Grand Rounds trail system at Lake Nokomis, Three Rivers Park District's Nine Mile Creek Regional Trail in Richfield, and the Mall of America in Bloomington. Possible connections across the Minnesota River to Dakota County'ss regional trail system also may be explored. Here is a link to the project page on the Three Rivers Park Districts website for more information (including meeting notes and more detailed route maps). It looks like there are some route alternatives to be hashed out where the trail would leave Lake Nokomis and head south down Cedar Ave. and that some bridge work might be in the offing. If you can, make it to the open house on Feb. 21 and speak your mind. It would be great to have another decent route south from MPLS, and other than the confusion around Cedar Ave, this route looks like a keeper to me. A lot of things are kind of hold at the moment due to some family commitments that have now been complicated with some medical issues. I've been traveling quite a bit more than usual, and that leaves little time to do things worthy of posting (and little energy to post when I do manage to actually do something). That said, I've got a few posts I'll get lined up before my next trip and meter them out as I can. I started a new gig this morning. Volunteering at a local food shelf somewhere in the 612. Because of client confidentiality, I am a little restricted in what I can say, and I can't take any pictures, so I am borrowing the photo for this post. Although this was only my first day, it was a positive experience. I started out organizing and re-stocking the provisions, facing the shelves like a grocery store so the customers could see what was in stock and have easier access to it. Once I had the shelves ship-shape, they moved me over to the check-in station, where I learned to take I.D. 's, get people registered and give them their slips. Once they were done getting what they needed, I signed them back out. It's a SQL database, much like databases I have used before, so the computer part was easy once I had the sets down. In case you are wondering if this service is "necessary", about half of my customers today told me that this as emergency pick up. After an hour of sign-in duty, we got a large produce delivery. By then it was pretty slow (most people come to the food shelf early), so putting produce away became an all-hands job and I ended up kind of supervising the perishable produce handling. We got that done, but the produce needs a sort yet - some of the stuff comes in mixed boxes so it's hard for people to see what is available. I'd like to get the produce arranged next time I go back if it's not done already. 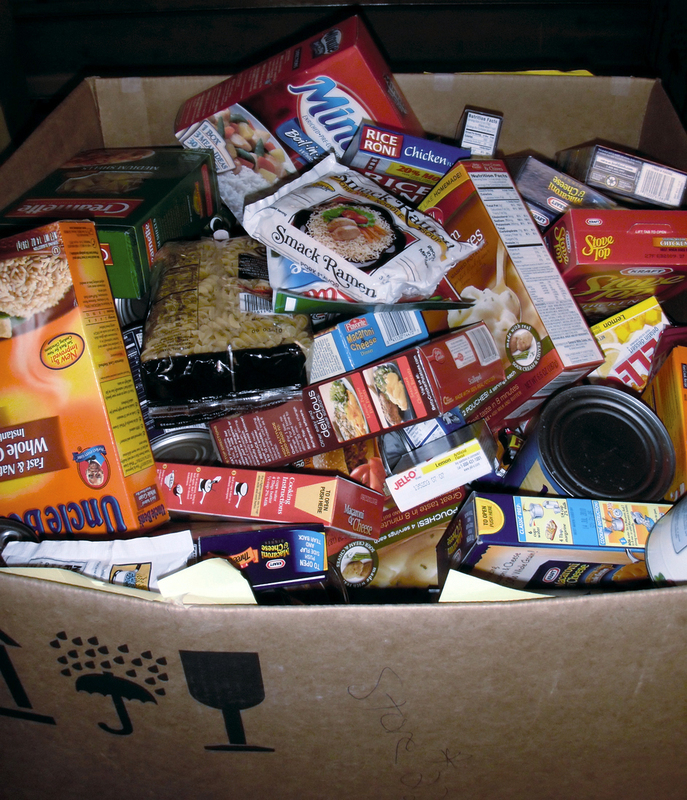 This was my first food shelf experience, per se. I did a Loaves-and-Fishes type effort in Connecticut, picking up either bread or produce (I did both) from grocery stores in Guilford, Branford and East Haven for delivery at a drop location in New Haven. That was a lot less formal - no background check, no supervision, no nothing. This food shelf I am currently working at is a much tighter ship - better inventory, better customer service and actual records of what comes in, goes out and how many people get support. I got a nice volunteer buzz from the morning's work and felt like I helped some people and advanced the mission of the food shelf. I think this kind of volunteer work is important to building community; I am probably a little late in starting here, but I think it will be a good gig. Plus, the boss told me I could bring my bike inside rather than locking up outside. Sweet.